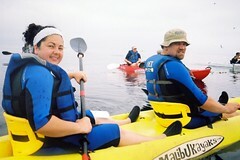 We had a good time Sunday morning kayaking La Jolla Cove. We did a tour with Scripps Aquarium, who provided several ocean experts to go along with the kayaking instructors. I veered between being amazed that we were up that early to being amazed that we weren't the people on the cliffs staring at the kayakers. It was a lot of fun, and we'll probably find an opportunity to kayak again.